Was Israel established in 1948 by ethnically cleansing Arabs from Palestine? Where does scholarship stand on this question? The answer can be found by examining the nature of the denials. Israeli historian Benny Morris denies that what happened in 1948 was ethnic cleansing, yet his own research shows that this was indeed the means by which the “Jewish State” came into being. Hey! 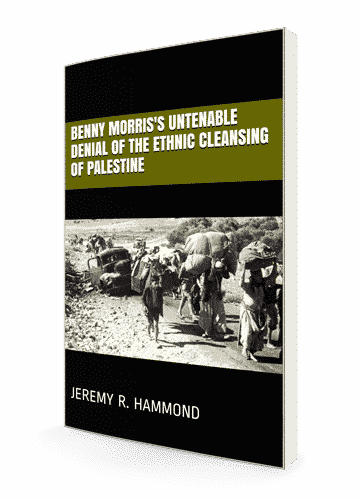 I’m Jeremy R. Hammond, author of Benny Morris’s Untenable Denial of the Ethnic Cleansing of Palestine. I’d like to tell you the story of why I wrote the essay contained in this short book. When it comes to the Israel-Palestine conflict, the main question we should be focusing on is: How it be resolved and a just peace realized? To be able to answer that question, we need to understand the conflict’s origins and the reasons it persists today. The problem is that most of what people think they know about the conflict simply isn’t true. The propaganda narrative that the general public is inundated with is that Israel was established through a legitimate UN political process resulting in the fair partition of Palestine into separate Jewish and Arab states. But the Arabs rejected Jewish self-determination, and when the Jews declared independence on May 14, 1948, the Arab states launched a war of aggression to wipe the nascent state off the map. The truth is that the UN “partition plan” resolution, General Assembly Resolution 181 of November 29, 1947, neither partitioned Palestine nor conferred any legal authority for the Zionists’ unilateral declaration of the existence of Israel on May 14, 1948. Furthermore, by that time, 300,000 Arabs had already fled from or been expelled from their homes by the Zionist forces. By the end of the war, more than 700,000 Arabs had become refugees. This is the origin of the Palestinian refugee problem that exists today. This is not controversial. And yet, there remains debate about whether what happened amounted to the crime of ethnic cleansing. To understand the conflict’s origins, it is critical that we be able to determine an unequivocal answer to the question of whether the “Jewish State” of Israel was established through ethnic cleansing. A unique opportunity to do just that presented itself in the fall of 2016. In the pages of the Israeli newspaper Haaretz, a debate raged between Israeli historian Benny Morris and a number of his critics. While his critics argued that ethnic cleansing did occur, Morris maintained that it did not, arguing that, while hundreds of thousands of Arabs fled or were expelled, this was not undertaken as a deliberate matter of policy. Morris’s view accords with the US mainstream media’s narrative that the creation of the Palestinian refugee problem was simply the tragic consequence of a war started by the Arabs. But how well does that narrative stand up to scrutiny? What does the documentary record actually tell us? In the US, the media do not even touch the question of ethnic cleansing. It is as though there was not even a debate about it. In Israel, however, it’s another story. 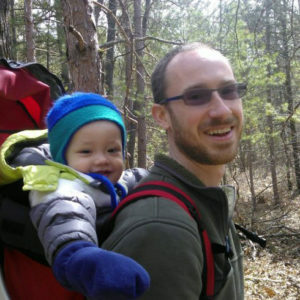 The series of back-and-forth articles in Haaretz presented an opportunity to examine the primary arguments used by those who deny that ethnic cleansing occurred, which are summarized by Morris in his contributions to the debate. And what we can learn by examining Benny Morris’s denial is that it is irreconcilably contradicted by his own research! By simply comparing the arguments made by Benny Morris to deny ethnic cleansing with his own research into the documentary record, we can see that his denials cannot withstand scrutiny. For one, this book is important because many — if not most — Americans are not even aware of the idea that Israel’s creation involved ethnically cleansing Arabs from their homes. It’s not that they don’t believe it happened, but that they have never even heard it suggested before that Israel’s creation involved anything other than a legitimate political process followed by a war started by the Arabs! That is unacceptable. The mainstream media has utterly failed to properly inform the public about this issue. My book helps remedy that. Furthermore, my book answers the question once and for all, by closely examining the arguments of a prominent denier, of whether Palestine was ethnically cleansed in 1948. The answer (as indicated by the title!) is: Yes, it was ethnic cleansing. If you’ve only just been introduced to the suggestion that Palestine was ethnically cleansed of Arabs (i.e., if you only ever get your info from the US mainstream media), this short book will serve as a great introduction for you as to what the controversy is all about and what the documentary record shows. If you’re well aware of the debate, but are not convinced that what happened amounted to the crime of ethnic cleansing, this book will show you why there is absolutely no question about it: ethnic cleansing occurred. If you’re well-read on the conflict and know all about how Palestine was ethnically cleansed, this book will help you in your efforts to educate others by giving you the appropriate responses to the doubts and denials you no doubt routinely encounter as an advocate for a just peace, which must include respecting the right of Palestinian refugees to return to their homeland. Benny Morris’s Untenable Denial of the Ethnic Cleansing of Palestine is also a great companion to my other books on the subject! Empower yourself with the knowledge to become an effective voice for peace. Read this book and learn the arguments to help put to rest this artificial “debate” about whether ethnic cleansing occurred. It is a documented historical fact — untenable denials notwithstanding! A short easy read that does an excellent job of laying out the history of the Zionist movement in Palestine and it’s goals of driving out the Arab inhabitants for the establishment of a Jewish State. Written with well documented quotes and historical evidence this overview leaves the reader with no doubt that ethnic cleansing did indeed take place in Palestine/Israel and continues to this day and that any future peaceful negotiations to be reached are greatly hindered by dismissing and covering up the shameful history of Israels founding and the horrible basis for the continued mistreatment of Palestinians. A must read eye opener that I only hope and pray will get into many many more hands…. Short, to the point, not a wasted word. If you are only going to read one short book or long essay on the vital history of Israel this is one of the best reads on the subject. It’s available in PDF and Kindle formats. The PDF is only 49 pages, so the essay contained in this booklet will quickly bring you up to speed with the key information that you need to know. It’s a short read, but it gets right to the point! It’s also fully referenced so you can check my sources and use it as a resource in your own efforts to educate others about the true nature of the conflict, it’s root causes, and the reasons for its persistence. How is it different from your other books? I discuss the ethnic cleansing of Palestine in my other books on the conflict. However, none go into as much depth as Benny Morris’s Untenable Denial of the Ethnic Cleansing of Palestine. This book essentially picks up where my book The Rejection of Palestinian Self-Determination: The Struggle for Palestine and the Roots of the Israeli-Arab Conflict leaves off. Rejection discusses it only briefly in the final chapter, so reading it first, then Benny Morris’s Untenable Denial will give you a great understanding of the conflict’s origins. I also discuss the ethnic cleansing in my book Obstacle to Peace: The US Role in the Israeli-Palestinian Conflict, providing this historical context as necessary for readers to understand more contemporary events and why the conflict persists. Benny Morris’s Untenable Denial goes into much more detail and, unlike Obstacle to Peace, also directly addresses the arguments made by those who deny that ethnic cleansing occurred. Finally, I also discuss the ethnic cleansing in my newest book on the subject, Exposing a Zionist Hoax: How Elan Journo’s “What Justice Demands” Deceives Readers about the Palestine Conflict. In this book, I directly address Journo’s denials that ethnic cleansing occurred, but since Journo, unlike Morris, addresses the question only superficially, I don’t go into as much detail. Benny Morris’s Untenable Denial is therefore a great companion for this book, too. Together, these books give you what you need to effectively answer the arguments of Zionist apologists for Israel’s crimes against the Palestinians. Prefer to Buy Benny Morris’s Untenable Denial of the Ethnic Cleansing of Palestine Individually?